You can play your media files on many popular Motorola mobile phones: Droid, Milestone, QUENCH, etc. Predefined profile settings have been created for each Motorola model. Click Formats >> Select Device Profiles >> Motorola >> ( Select desired device profile ). This is an example of Motorola QUENCH video device profile. Your media files are converted to MPEG-4 format. The Intel(R) H.264 (AVC) compressor takes less space than other compressors for same quality. The frame rate is set to 25 Fps and bitrate is 512 Kbps. You can choose to preserve or change the video dimensions. 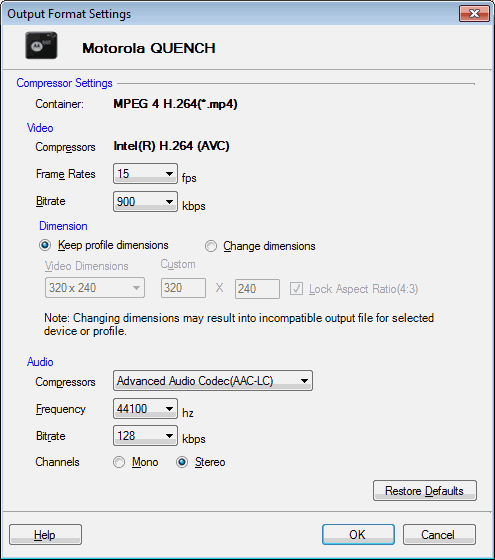 The audio compressor used is Advanced Audio Codec. It can be changed to MP3 from the dropdown. Advanced Audio Codec ( *.AAC ) files are generally higher quality and slightly smaller than MP3 ( MPEG 1 Layer 3 ) files at similar bit rates. The frequency is set to 44100 Hz and bitrate is 128 Kbps. The Stereo audio channel creates an impression of sound heard from various directions.